Welcome to our Yoga Calendar! 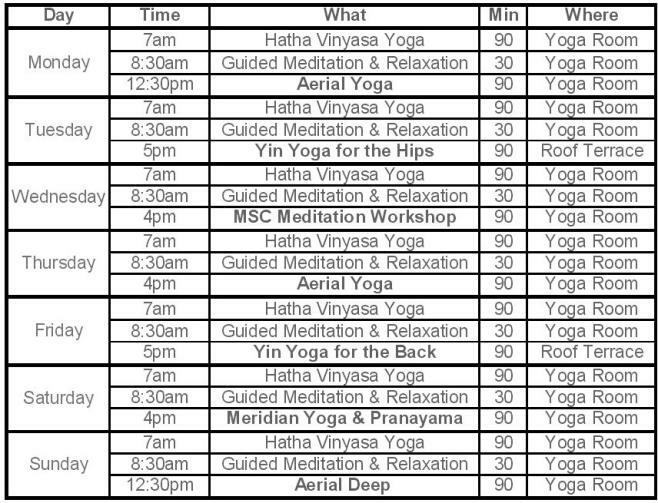 Here you can check on which days we offer which classes, a special retreats or have a guest teacher visiting. You will also see on which days there will be no yoga (because I will travel around the world to learn more about yoga myself ;-). Our two retreat packages, the 4 Day / 3 Night Yoga Bliss and the 6 Day / 5 Night Yoga Immersion Retreat will start whenever you want it to. If you book the retreat package together with one of our rooms or suites, we can offer some interesting discounts. Just drop me a mail and ask ;-). You also can book these retreats as a Walk-In Guest, in case you prefer to stay in another hotel in Galle (20min drive) or Unawatuna (25min drive). And of course you always can share the room with your "No-Yoga-Buddy", who just likes to come and enjoy our wonderful pool :-))). > Read here more about our wonderful new yoga retreat packages :-). Here is our class schedule for the next months. Come and join a yoga class as a day guest! We are looking forward to welcome you here! Please always do register for the meditation and the classes on the next day until 8pm. Thank you :-)!